While this site boasts some of the very best talent in the world, I’m always excited to discover one more multi-talented artist to introduce here. 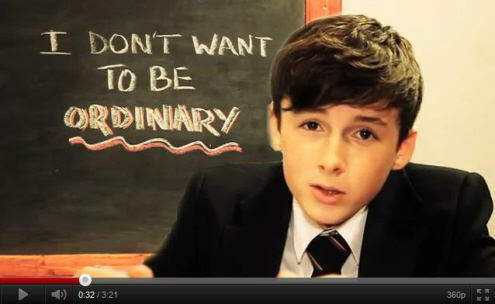 About a month ago I discovered 13 year old Josh Taylor’s YouTube Site for the first time. He was singing his original song entitled “I Don’t Want to Be Ordinary” which contained a powerful message wrapped up within an amazing musical masterpiece! In addition the video was artistically produced and acted out with such professionalism that I knew I had just found a youngster that was NOT ORDINARY! 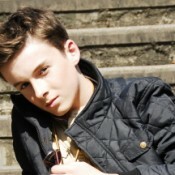 I thought to myself who is this young performer? Is he signed? Is he being produced yet? I immediately read the description contained within that post and found that he was working with two amazing writers, Matthew Humphrys and Andrew Beverley of 360 Artist Development. It only took moments to compose a letter to his production team requesting more information about Josh in an attempt to learn more about him. I was delighted to be put in contact with Josh’s Father who graciously supplied me with the following insight into the background of his extraordinarily talented son! After watching and listening to Josh, I was amazed to learn that nether of his parents were musically involved in the arts in anyway. This discovery lent itself quite well to the theory of a God given talent from birth, and in Josh’s case, was born with NO ORDINARY portion!